Brimming with royalty and luxury, the heritage hotels of Rajasthan made me feel as if I was traveling to a different world altogether. The opulent palaces, havelis and forts of this land are a heritage of traditions, royalty and luxury beautifully accumulated over the years. My visit to the internationally famed heritage hotels opened up a path for me to slip into the bygone era of Raja-Maharajas. The experience was simply overwhelming! stunning palaces in India. Its foundation was laid in the 17th century by Maharana Jagat Singh II. 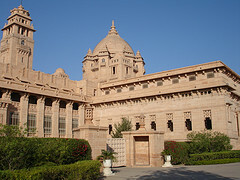 Attracting even the Hollywood stars like Angelina Jolie and Madonna, the palace is managed by the Taj Group. The palace consists of several opulent chambers such as Phool Mahal, Dhola Mahal, Ajjan Niwas, Khush Mahal and Bada Mahal. Reflecting the grandeur of the bygone era, this palace is India’s first heritage palace resort. From the traditional interiors to the recreational activities, everything has a royal feel to it in this palace. With around 347 rooms, this palace is one of the largest palaces in the world. It is the royal heritage of Maharaja Umed Singh. An interesting fact about the palace is that it always maintains pleasant temperature. It is a luxurious establishment offering kingly experience to its guests. Everything about this hotel is regal. Located ideally amidst the beautiful Aravalli hills, this palace is a perfect blend of the Medieval, Rajput and European styles of architecture. Built in an impressive style, the interiors of the palace boasts of beautiful semi-precious stones. 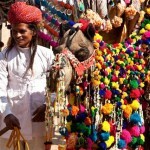 acres.Done to perfection, the interiors and furnishing of the hotel reflect the royal taste of Rajasthan. This grand and luxurious hotel bagged several awards such as the ‘Heritage Award for Excellence’ and the ‘National Tourism Award’ for the best heritage hotel for its royalty and hospitality. Offering wonderful views of Lake Pichola, the palace is luxurious to the hilt. «Next Post Bharatpur National Park- Most Talked About Abode of Enchanting Birds!